Hard drive failure is perhaps the number one cause of lost video in a surveillance system. But which hard drive manufacturer, if any, is most reliable? Are all hard drives the same? 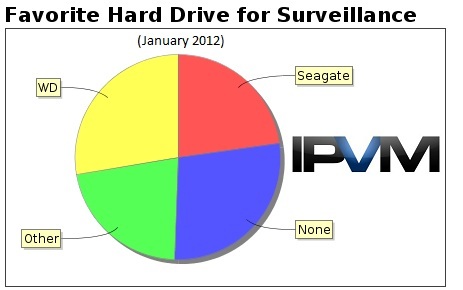 As part of our Winter 2012 Integrator Survey, we asked 100 integrators what their preferred hard drive for surveillance was. Among those with a preference, more integrators chose Western Digital, at 27%, than any other. Seagate was second, at 23%. Hitachi was a distant third, with 6%. A few other manufacturers received a mention, though none managed to gather more than 1%. What is striking, though not surprising, about these responses, is the percentage of integrators with no preference: 28%. Other questions of favorites in our surveys had almost no "no preference" responses. The reasons for this become evident when we look at the quotes from these integrators. "WD Black, best reliability so far." "Western Digital Black Enterprise. Great Warranty. Failure rate less than 3%"
"We use Western Digital RE4 or Caviar Black hard drives. Supposedly the RE4's are designed for 24/7 enterprise operation and will stand up to the rigors of constant usage. We have been falling back on the Caviar Blacks as of late because of the speed, reliability and lower price point. With the hard drive prices the RE4 drives are just too expensive." "We've found the Western Digital Caviar Black drives to be fairly reliable and cost-effective (short of going to server-grade drives)." "Western Digital Raptor Series, 10K rpm good value for smaller camera counts." The Caviar Black line, a SATA desktop hard drive, was the most mentioned Western Digital model, followed by the RE-4 Enterprise Drive. "Seagate: Best reliability and RMA procedure. Have used various brands before: Western Digital, Hitachi but these just never performed well for us." "Seagate. I've worked in IT before surveillance and they have always been the most reliable." "I prefer Seagate SV35 since manufacturer claims it is manufactured for professional security." "Seagate Constellation ES - We have found these to be extremely reliable, there not the cheapest though. We generally configure them with a good quality 8 lane raid card (again not cheap) and enable write cache and as big a stripe as the raid card will allow. Its very important to use a battery module on the raid card when doing this." "I have had great luck with the Security designed Seagate hard drives. That isn't to say there aren't equals or better options but thus far Seagate has been solid." The Seagate SV35 and Constellation Series were both popular among respondents. "I like Hitachi, I get a lot of failures with Seagates for some reason. Western Digital fails too. But I think it is just bad luck. For instance I had some cheap consumer seagates that last forever and enterprise level seagate drives that died after a few months"
"Hitachi Ultrastar or Western Digital Black series. Reputation for reliability." "No preference. We typically use Dell servers and get the extended warranty for hard drive replacement." "No preference - we typically use HP branded product to match our standard IT systems. Their hard drive vendors vary." "no preference it is already installed"
"We use whatever the storage provider ships us." "I have no preferences in manufacturers. But since we work mostly with Milestone I prefer to have 10k rpm live disc. For archiving 7200 is sufficient. I can't think of any manufacturer better than another, all major manufacturers have about the same quality and sometimes they all release a bad model, there is no way to tell in advance. As long as they have good warranties we're fine." "No preference. As long as the Hard Drive is surveillance rated." "It doesn't matter as long as it's an enterprise harddrive"
Interestingly, when looking at responses, no one manufacturer stood out as having higher reported failure rates than others. Western Digital, Seagate, and Hitachi all received about the same number of comments about being prone to failure. We suspect that this may mean that any of these three top choices are relatively safe. These preferences remained fairly unchanged across all average system sizes. Integrators' leaning towards analog or IP cameras also had trivial effect.